In the middle of the 19th century a must-have for any respectable Victorian household was a piano-forte. In the 1860s piano merchants clustered in the Broadway area, providing ease of shopping for potential buyers. Among these, Chickering & Sons was located at 295 Broadway; Lighte, Newton & Bradbury was a 423 Broadway and Decker & Company had showrooms at 419 Broome Street, a block east of Broadway. The land on which J. P. Halle & Company’s building stood was owned by the Roosevelt family. The family had a long tradition in the real estate business. Rising from a distinguished line of Dutch settlers, the Roosevelts made their fortunes as successful merchants, and later erecting numerous speculative buildings. Within a decade the neighborhood was changing as high-end apparel merchants crept in. Lawyer James Henry Roosevelt, who founded the Roosevelt Hospital, bequeathed the land at Nos. 478, 480 and 482 to the institution. In 1873 the hospital commissioned Richard Morris Hunt to design a commercial and loft building on the site. J. P. Halle & Co. and its pianos were about to go. Hunt had already designed several substantial structures including the Stuyvesant Apartments (New York’s first apartment building) and the Presbyterian Hospital. Before the end of the century he would be renowned for such buildings as the Tribune Building, the vast Vanderbilt Newport cottages of The Breakers and Marble House, and the base of the Statue of Liberty. For No. 478-482 Broadway, which would be known for a short time as the Roosevelt Building, he turned to the currently-popular cast iron façade. But while other architects were using the material to mimic stone; Hunt broke away in a radical departure, using the versatility of the iron to enhance the function of the structure. Completed in 1874, the wide, five-story building was ground-breaking. Architectural Record praised it as “the most serious attempt to utilize the almost unlimited strength of the material.” The reference was to Hunt’s use of slender colonettes between the windows of the second through fourth floors which allowed for great expanses of glass; impossible in a masonry building. Hunt used a Neo-Grec base of four chunky pilasters to support the airy mass above. Two enormous three-story columns, flanked by matching pilasters, rose to lacy, openwork screens that created pseudo-arches below the fifth floor. Stubby pilasters supported the flat cornice where delicate, openwork brackets branched out to be “relished,” as suggested by the AIA Guide to New York City over a century later. The building, shaped like a chubby L, extended to No. 40 Crosby Street where the triple-arched design carried over in a baby-brother size. Three stores made up the street level. The ground floor was divided into three distinct shops, while full floors were available above. As the neighborhood filled with textile and apparel companies, so did the Roosevelt Building. One of the first tenants, in 1874, was Collins, Downing & Co., importers and jobbers of woolens. At the time it was the oldest established firm in the business, having begun in 1842. It opened its store at No. 478. “The immense salesrooms are handsomely fitted up and are well lit, while for variety, freshness and completeness of assortment, the stock of woolens here displayed has few equals, and no superiors in America,” said the article. Collins, Downing & Co. kept a team of twelve to fifteen buyers traveling globally to purchase woolen goods. “The firm makes a prominent specialty of importing the finest lines of foreign goods and handle the output of many of our leading domestic manufacturers,” the writer said. Not all the publicity for Collins, Downing & Co. was as positive, however. Ten years after moving in, on April 8, 1884, a “handsomely dressed woman, with pale, clear-cut features and light golden” stormed into the store with a friend and demanded of Silas Downing to see his son, Forest. Although she was told he was not in, she spotted him in the back of the store. “A moment afterward a sharp slap was heard,” reported The New York Times the following day. Then things got worse. Forest Downing pushed the screaming women through the store and thrust her onto the street. She came back. Downing tossed her out again. By now a small crowd had gathered outside, attracted by the commotion. Silas Downing ordered the woman out, accusing her of coming merely to make a disturbance. Eventually police were called and the woman, who claimed to be Mrs. Savvillar Downing, was taken away. But it was not only Collins, Downing & Co. that ran into problems here. Hammerslough & Brothers was a wholesale dealer in men’s and youth’s clothing. The firm hired Bernard Russell as its head salesman with the handsome salary of $5,000 a year. But in 1883 “he was found to be a gambler, a dabbler in stocks, and infatuated with women,” according to The Times, so he was fired. Russell confessed to stealing 200 coats, worth from $2,000 to $2,500, and 700 yards of silk. 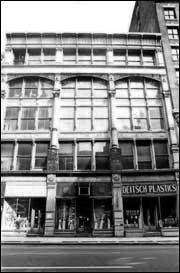 As the turn of the century arrived, other tenants included Cole & Williams, manufacturers of plush and celluloid cases and novelties; Voss & Stern (Philip Voss sold laces and embroideries while Isaac Stern handled curtains and veilings); and Garner Sons & Co., jobbers of ribbons. While Louis Gartner and his sons dealt primarily in the very feminine product of silk ribbons, J. Gartner used the address as well for his business of breeding Great Danes. The building continued to attract the apparel trade into the 20th century. In 1919 The American Hatter announced that Max Kreienbuhl opened his office here on August 1. Kreienbuhl represented foreign manufacturers including Italian “Milan, five-end and fancy braids;” Fratelli Ballerini’s line of “Leghorns, pedal and fancy bodies for the men’s and women’s hat trade;” and was hoping at the time to take on a Japanese line of hats and braids. Today, appropriately, No. 478 Broadway is home to an apparel store – the British megastore Topshop that fills four full levels. Although the Architectural Record praised Hunt’s design and at least one modern critic has called it “one of the most significant iron-front buildings in the world;” No. 478-482 Broadway receives mixed reviews. The building is, however, a crowd-pleaser. Its clean, well-preserved façade demands attention, if not critical acclaim, and it represents one of the few extant Richard Morris Hunt buildings in Manhattan.